2 Acre Waterfront Estate Villa,sleeps 6 -18 persons from $1,700 per night. nowhere in the Turks and Caicos can better views like these be found. offers the best of everything, with its tropical gardens, 2 pools, wet bar etc. and cays, which the property overlooks. Mr. Mullarkey, born in the UK, in 1943, emigrated to the USA in 1962, became a Vietnam veteran in 1966, and started investing in the Turks & Caicos in 1990. Married with 4 children (with one set of triplets). Mullarkey Realty LLC, is based in Queens, New York, USA. 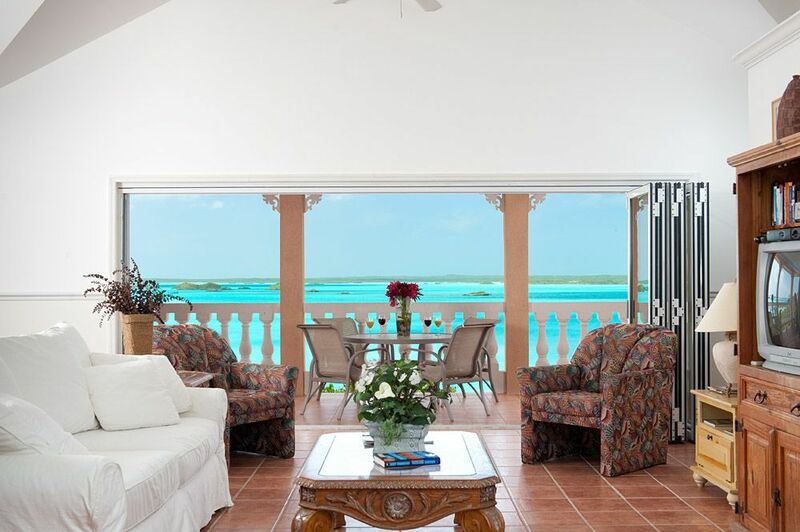 EI#75-3059897, Mr Mullarkey, has been operating real estate properties since 1972, Emerald Shores Estate, on Providenciales, and the Whitby Beach Cottage on North Caicos, are some of the properties owned and run by Mr. Mullarkey. Emerald Shores Estate, ( TCI Business licensing Ordinance # is = 9426 ) was issued by the Turks & Caicos Government, in February 2005. We welcome, anyone interested, to check out these credentials, before entering into an agreement. After seeing many property's that day with the broker, that were nice, but just weren't what I was looking for, we decided to head back to the Hotel, then the Broker said = "O.K, I'll show you one more on the way home BUT, its not my listing" its from another broker ? so I said to myself OK what do I have to loose ? You couldn't see the lot from the road so we had to climb up a ridge to see it, "WHAT A SIGHT" what unbelievable views it had. It was love at first sight, I immediately turned to the Broker & said "I'LL TAKE IT " but I haven't given you the price yet" the Broker said, "I don't care about the price" said, " I'll TAKE IT". As a practicing christian, my first thought was why should views like this be hidden, I'll build a house on this spot so everyone can enjoy these views of Gods creation. I've got many comments from guests, for instants = (" pinch me, so I know I'm not dreaming") ("but I don't want to leave") but most of them just have their mouths open when their eyes are looking at the views of Chalk Sound for the first time, But I didn't want to stop there, I said to myself, when I build a house I wanted it to be just as beautiful as the views around it (SO I DID), I have family reunions, groups from 10 - 18 persons, small weddings, etc in mind. and since then, that's just what's been going there. its just a great feeling when just about every party that goes there, sends me a note after to say = thank you. All the bedrooms in the Main house have en-suite bathrooms, and one powder room on each floor. The Guest house has one bathroom on each floor. 2 minutes drive to Taylor bay Beach from the house, small waves, and not very deep for quite a way out, Ideal for small kids, The waters are crystal clear, & warm all season. From the Guest house upper, you can see 3 bodies of water at the same time, Chalk Sound National Park, Silly Creek Marina and the Caribbean sea, which change colors in different times of the day. Chalk Sound National park is in your backyard, which is a 5 1/2 square mile inlet of the Caribbean sea, which has over a hundred different small islands & cays to explore with your Kayaks. Free local calling from the Main house phone. All bedrooms have air condition units. There is a Washer & Drier provided on each floor of the Main house. The Guest house has a washer & Drier on the 1st floor. Free wireless internet in both the Main house and the Guest house. All towels are provided, even Beach towels. The view from the living rooms are breath taking. We have satellite TV with most Major channels. Main house upper has a very large balcony, with unbelievable views, of Chalk Sound National Park, with over a hundred cays. The Guest house upper balcony also has unbelievable views. We have 2 Kayaks for your pleasure, to explore Chalk Sound and all the Cays. There is an 18 hole Golf course 15 minutes away. The 2 bedroom lower Guest house unit has no steps, also to getting to any of the pools, requires no steps. Personal safes in every bedroom, CD,VCR and DVD players, Satellite TV, Wet Bar, Barbecue, A/C in every bedroom, Microwaves, 3 Washers, 3 Driers, Kayaks, free wi-fi in both houses Etc. Each house has its own pool. If you want to see coral and can't swim, (no problem) you can see the coral through the crystal clear water from simply standing at the dock. If you feel comfortable going wading/standing in the water, there are large steps leading into the waters of Chalk Sound, with a white sandy bottom, the water level starting off around 2 1/2 to 3ft deep. There you'll see different colored corals, with many species of tropical fish. There's never been anything to my knowledge harmful to humans in these waters, which consists of over 5 1/2 square miles, with over a hundred small islands & cays to explore with your kayaks, and best of all = its almost IMPOSSIBLE TO SINK with the heavy salt content in the water, you could just LAY ON YOUR BACK, AND YOU'LL FLOAT ALL DAY, and it's also only 2 minutes to Taylor Bay Beach from the house. So you may do = Swimming, Snorkeling, Fishing, Boating etc, in the Sound, or in town , you can take a tour as a group in a mini Sub, were you can take a tour seeing Ocean reefs though the glass sides in the boat, there,s also many Beaches to see (did you know that the last 10 years that the Turks & Caicos have been rated #1 has having the worlds best beaches? ) you'll know why if you go there, you can stand in the water up to your shoulders and look down & see your toes, yes, the water is that clear. But there are so many other things to do there as well, like playing in an 18 hole golf course, learning scuba diving, deep sea fishing, day cruising to other islands, go-karts, MTV's, horse back riding along the beach, day passes into Beaches Resort, Casinos, Restaurants, Bars (including Danny buoys Irish Pub) shopping, Modern Supermarkets that have all the products that your accustomed to.